If you love cooking outdoors and are also interested in adopting an eco-friendly lifestyle or living off the grid, a solar oven might be the perfect addition to your outdoor kitchen. This low-tech, green cooking option allows you to bake bread, melt butter, roast potatoes, make rice and do just about anything else you would do in your conventional kitchen but without the use of electricity or gas. Unlike barbecue grills that generally use fuels that pollute the air and are harmful for your family to breathe, a sun-powered oven allows you to cook outdoors using nothing more than sunlight. Of course, that does not mean that you have to give up grilling steaks and enjoying corn on the cob fresh from your barbecue, but it would provide you with another outdoor cooking option for cooking side dishes or baking bread to go along with your grilled meats. Solar ovens are not for everyone, but if you can appreciate the convenience of a slow cooker that you can leave going while you run errands or work, then this no-cost, greener cooking option might be right for you. A solar oven might also be a good addition for your outdoor kitchen if you are interested in preparing for disasters and emergencies, of if you are working towards a more sustainable, self-reliant lifestyle. Before we go into how to use a solar cooker to prepare healthy meals for your family in your backyard, let’s go over a few questions most folks who have never used a sun-powered oven usually ask. A solar oven is an outdoor cooking device that focuses the energy of the sun to bake or cook meals without the use of typical cooking fuels, such as electricity, gas, charcoal or wood. Where are Solar Ovens Used? Solar cooking devices require direct sunlight in order to perform properly, so they are primarily used only in areas where sunlight is abundant. Some people use solar cookers when camping or backpacking, some keep one on hand as part of their emergency preparedness efforts, some use them as part of living off the grid and some families use them as their primary method of cooking. These outdoor cooking devices are also widely used in developing countries and poverty-stricken areas where cooking fuel is scarce or expensive. Solar ovens are growing in popularity around the world as more people become interested in adopting a more environmentally friendly lifestyle and becoming more self-reliant. Does it take Longer to Cook Food in a Solar Oven? The time it takes to prepare a meal in a solar cooker depends on a number of factors, including the type of oven being used, the amount of sunlight available, the position of the cooker in relation to the sun, the type and quantity of food being prepared, the time of day the food is being cooked and the air temperature around the cooking device. 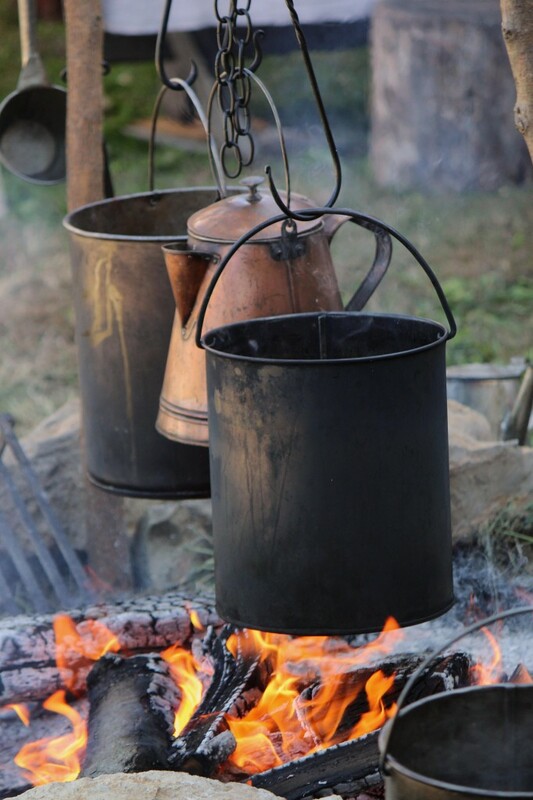 With particular foods being cooked in ideal conditions, the cooking time may be about the same as it would take to cook the food using a conventional stove or oven; however, it will generally take longer to cook food with a sun-powered cooker. It is best to think of a solar oven more like a slow cooker (like a Crock Pot) in terms of time and convenience. While it may take longer for your meal to become fully cooked, you can prepare the meal, put it in your solar cooker, and then forget about it until it is time to retrieve your fully cooked food. Because the food cooks slowly, you do not need to watch it, stir it or worry about it burning. These ovens require no fuel, and there is no cost to operate a sun cooker; therefore, the only expenses involved in cooking your food with sun are the initial cost of the oven and any repair costs that may occur if your oven is damaged. Purchasing a sun-powered oven is definitely not cost prohibitive; in fact, one of the reasons they are making such an impact in developing nations is because of their low cost. 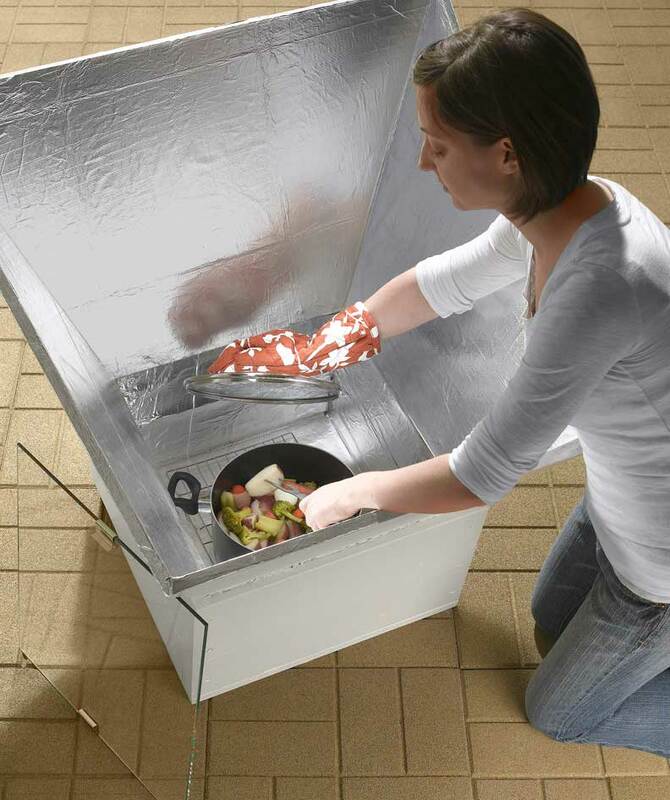 While you can spend a few hundred dollars on a high-end solar cooking kit, you can also purchase a small unit for less than $100 or make your own with easy-to-find materials you can pick up at your local home improvement center – or a cardboard box and some aluminum foil. Because of their low cost, most people choose to go the easy route and purchase an oven. Professionally manufactured options also tend to be more efficient and longer lasting. No, solar cooking is actually easier than cooking indoors. Pre-cooking food prep is almost identical regardless of whether you are cooking on a conventional stove or using an outdoor sun cooker. Once you have the food in the pot and ready to go, you simply place it in the solar oven, position your oven so that it will get optimal sunlight during the cooking time, and leave it alone until it is time to check your food to see if it is fully cooked. Unlike indoor cooking, you do not have to stir or repeatedly check your pot during the cooking phase. You also do not have to worry about checking your oven multiple times to make sure you have not burnt your dinner – you can leave your food cooking in your solar oven way longer than you had planned, and it will still be fine. Is Using a Sun-Powered Oven Like Using Solar Panels? Using a solar cooking device is sort of like using solar panels, since you are harnessing the power of the sun to complete household tasks that would normally require another source of energy. However, rather than using photovoltaic cells to gather energy from the sun to direct into your home’s electrical system or store in a battery, you are directly using sunlight to heat your food. There is no middleman here and no need for expensive solar panels. You simply position your solar oven to receive the most sunlight possible, and let the sun heat your food for free. What Kind of Cooking Can I Do with a Solar Oven? You can steam, boil, bake, roast or dehydrate foods easily with a solar cooker. In an emergency situation when power is out, you can also use it to dry firewood to use for heating or cooking, pasteurize water or heat water for a bath. Most homeowners have an indoor kitchen conveniently equipped with a stove and oven, and folks who like to cook outdoors usually have an outdoor kitchen or a barbecue grill on their patio. But even with these cooking options readily available, a solar cooker can still be well worth the small investment required to acquire or build one. 1. You can save money by reducing your energy consumption. 2. 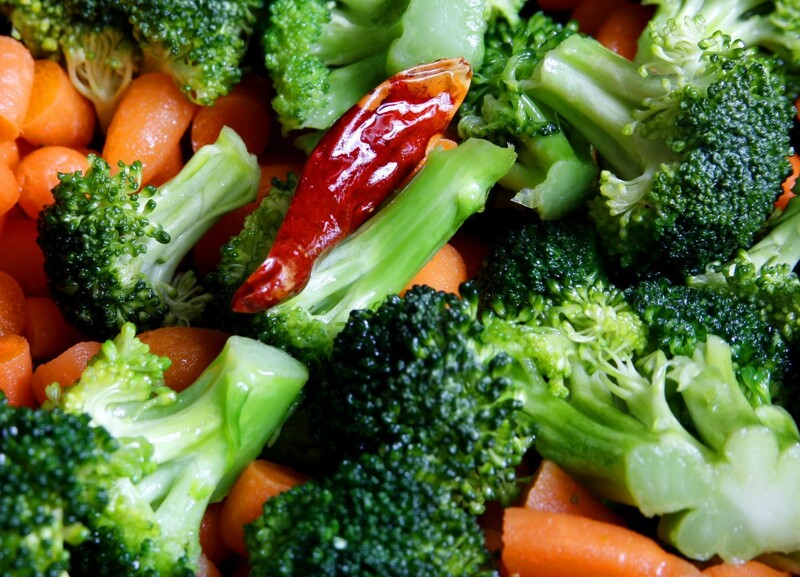 Your food will retain more nutrients since it is heated slowly. 3. You can reduce your impact on the environment by reducing your use of cooking fuels. 4. Adding a solar oven to your emergency preparedness kit will help you be ready if disaster strikes. 5. You can build one with your children to help them learn about alternative energy sources and how to prepare for an emergency. 6. Solar ovens are safer to use than conventional ovens or stoves. 7. You no longer will have to be worried about burning dinner if you leave it unattended while cooking. 8. Solar cookers can reach temperatures regularly used for cooking and baking. 9. Cooking with a sun oven provides a similar convenience to cooking with a slow cooker. 10. Solar cooking devices are portable and easy to use whether you are at home in the city or visiting your rural mountain retreat. 11. Cooking outdoors with a solar oven means you can steam, boil and bake foods without heating up your kitchen, which can help you save money with lower cooling costs. The first step in effectively using a sun cooker is choosing a place in your backyard that regularly receives direct sunlight. You will want the location to be conveniently close to the house but out of the way of children or dogs that might be playing in your yard throughout the day. Choosing a corner of your patio that receives good sun is usually best. A paving stone, brick or concrete patio is also a good choice because your oven needs to be on a sturdy, level surface to limit the risk of it toppling over during cooking. If you plan on using your oven like a slow cooker by placing your evening meal in it in the morning and allowing it to cook all day while you are working or taking care of other things, you should position it facing south. If you will be home and would like your meal to cook faster, you should position your oven facing the sun, and then reposition it about every 30 minutes to keep it optimally positioned to harness as much of the sun’s energy as possible. To shorten your cooking time, you can also preheat your solar oven by facing it to the sun while you prepare the dish you will be cooking. If you preheat your oven and reposition it throughout the cooking process to more effectively harness the heat from the sun, you can significantly shorten your cooking times and see cooking times that are much closer to the time it would take to cook the meal on the stove or in the oven. 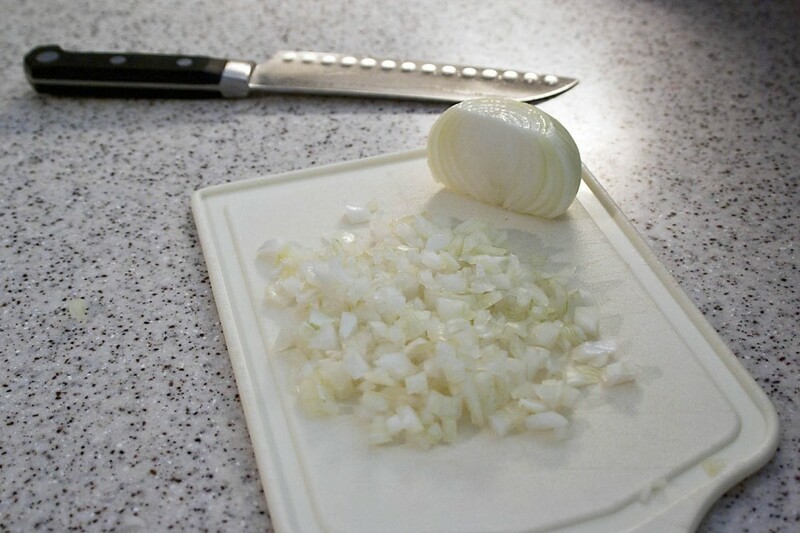 You can also shorten your cooking time by cutting food items into smaller pieces, which will make them cook faster. The pots you choose for use in your backyard oven will also affect its efficiency. Choose black or dark, non-reflective pots and pans to ensure optimal heat absorption. Once you begin to use your sun cooker, you will be able to play around with your favorite recipes to determine the cooking time and small tweaks that will work best with this new cooking method. For example, you need to place your fresh vegetables in water to cook them on the stove, but produce items with high moisture content do not require water when cooked in a solar oven. You will also want to get an oven thermometer to keep inside your solar oven to help you more quickly learn how to use it and to make sure it is reaching the temperatures needed for safely cooking certain foods, such as meats. If solar cooking sounds like something that would work for you and your family, you should spend some time online or in your local library to gather handy tips and tricks from experienced folks who regularly use solar cooking devices. The more information you have before you begin cooking in your sun-powered oven, the less experimentation will be necessary before you can begin reliably using your oven to prepare meals. There are also lots of useful recipes online and in solar cooking cookbooks that can help you more quickly master the art of cooking outdoors with free heat from the sun. Solar ovens offer a low-tech, easy-to-use cooking option that is free to use, requires no electricity or gas, and reduces your family’s impact on the environment. Simple, do-it-yourself solar cookers are easy and inexpensive to make and can even be made with your kids to help them learn about conserving energy or being prepared for an emergency. Inexpensive options are widely available, if you would rather purchase an oven or a solar cooking kit that comes complete with cooking pots, racks and recipes. Hybrid solar-electric ovens are also available – though a bit more difficult to find and more expensive – which allows you to use your outdoor oven on cloudy days or at night as well.